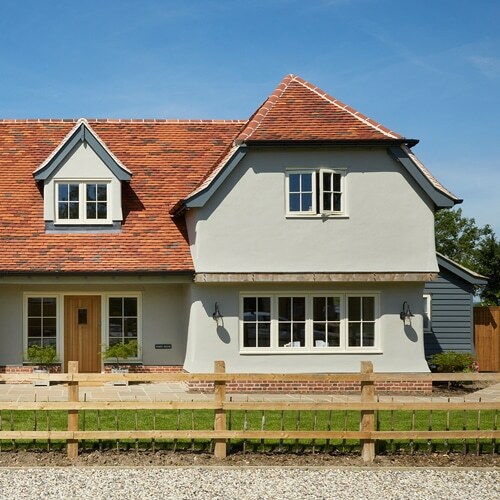 Set in the heart of the countryside an hour from London, this new build house boasts a classic Georgian style with spring balanced sash windows and an elegant entrance door. 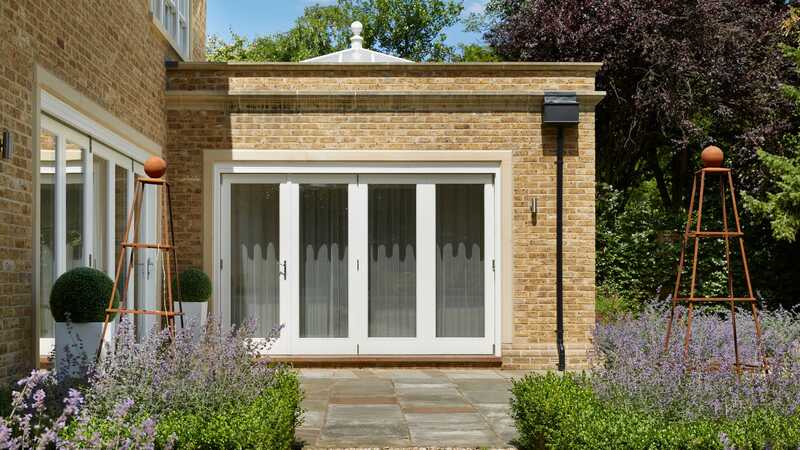 While the homeowners benefit from the performance of modern windows and doors, the property’s period style is enhanced with traditional timber joinery and classic architectural features, resulting in an elegant aesthetic. 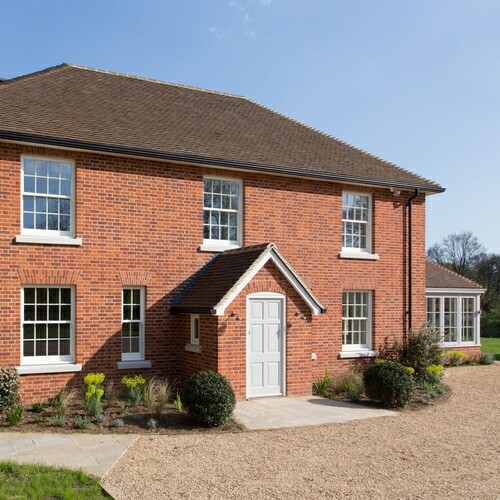 The front of the new build house has eight 6×6 spring balanced sash windows installed across both floors, which are all set within beautiful stone surrounds. In the centre of the first floor, a large triple Venetian sash window with two smaller sections on either side cleverly draws the eye and creates a central focal point. This special feature window lets lots of natural light stream into the main landing to create a bright and open space inside the home. 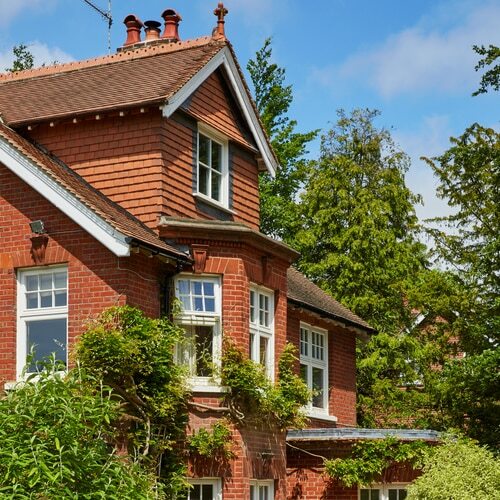 Up high in the side gables of the building, a direct glazed circular window is perfectly suited to the shape of the roof and lets plenty of light into the upper floor, while also giving a charming character to the property. 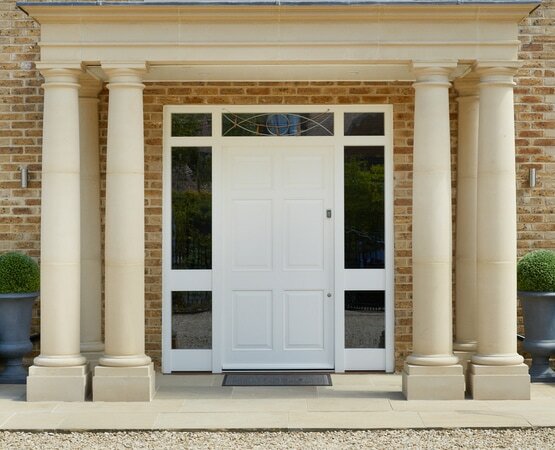 Perfectly balancing the proportions of the Venetian window, a 6-panel entrance door is designed with two glazed fanlights on either side, along with an elegant glazed fanlight above. In keeping with the Georgian style, the decorative upper fanlight has a traditional curved fishtail design in antique led. The entrance door itself is made from Accoya®, an engineered timber which is dimensionally stable with outstanding durability. It is water resistant, virtually rot proof, doesn’t swell, shrink, twist or warp and will have minimal moment in the joints, ensuring a long lasting finish. Unlike most hardwoods it’s also environmentally friendly, manufactured from sustainable pine forests. 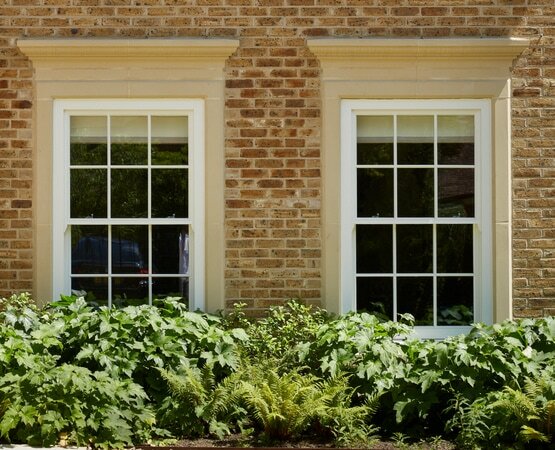 In older, authentic houses, sash windows would be installed at the front of the property in order to show off the more elaborate designs to passersby, while casement windows would be fitted at the back. 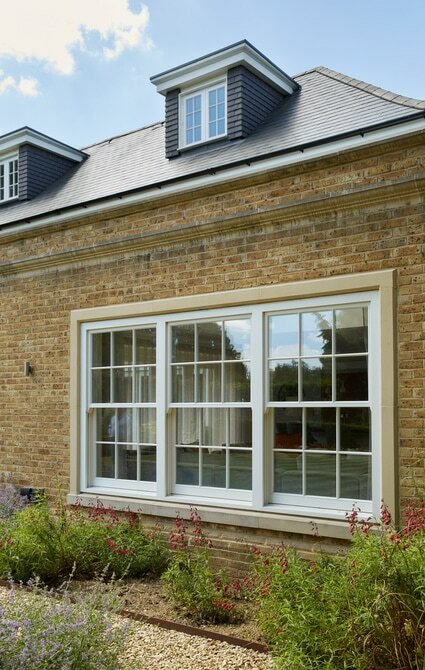 In this modern take on a Georgian property, we’ve upheld the tradition and fitted two dormer casement windows at the back of the house, which offers uninterrupted views of the garden beyond when open. 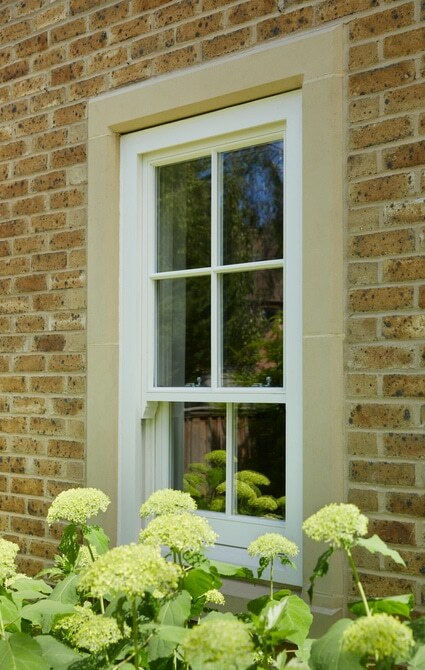 While either casement or sash windows would have been suitable designs for the windows on the first floor, we advised that an uneven sash window was more appropriate in order to maintain similar pane proportions to the windows on the first floor. Bringing a modern touch to the building, two sets of fully glazed folding doors open up wide in the summer, helping the main living area and extension to merge with the attractive courtyard outside. 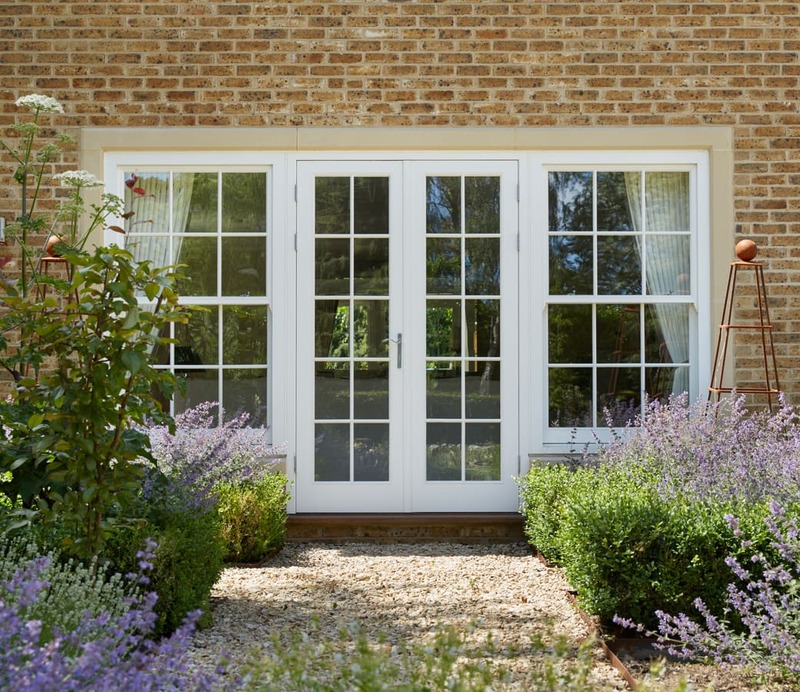 A set of French doors were installed with two sash window wing lights fitted on either side. While it’s notoriously tricky to get the bars to line up when using sash windows as wing lights, the design has been well executed in this project with balanced and matching lines. A simple, functional 4-pane back door with two raised and filled panels is a simple and practical side entrance in a matching style that maintains continuity across the house. All products are painted in a crisp, fresh Westbury White colour. I agree for Westbury to contact me via email in accordance with their privacy statement. With each and every new product we bring to our customers, our critical starting point in the design process is challenging the joinery industry we are in. We believe in innovation. We believe in thinking differently.